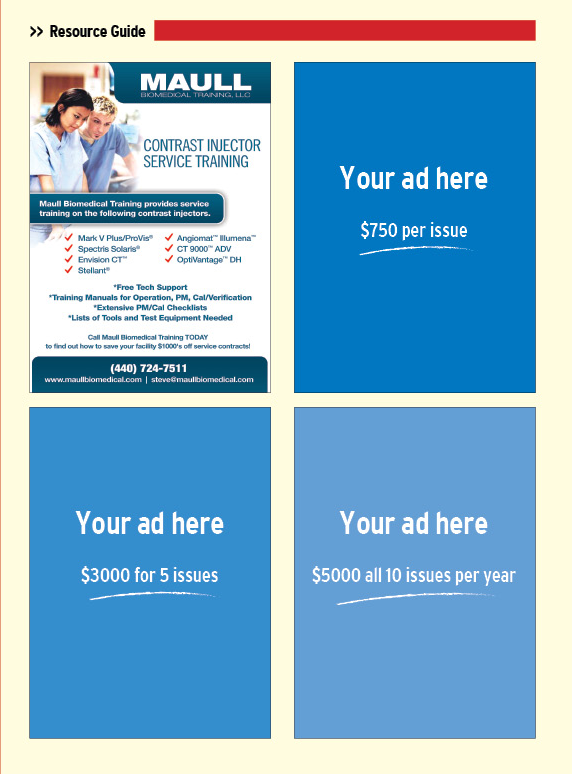 HealthCare Business News is bringing back affordable combo print & online advertising rates with our new Resource Guide. 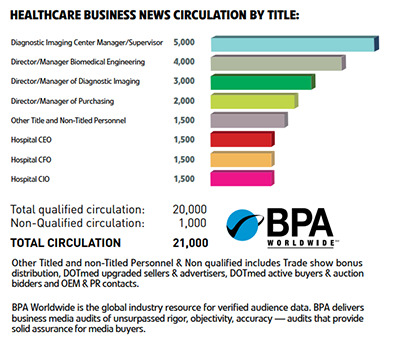 Every issue of HCBN magazine will contain a Resource Guide filled with quality companies offering unique services to our BPA Audited 31,000+ magazine readers. All Resource Section advertisers will rotate on DOTmed's homepage & on Service and Company searches.. 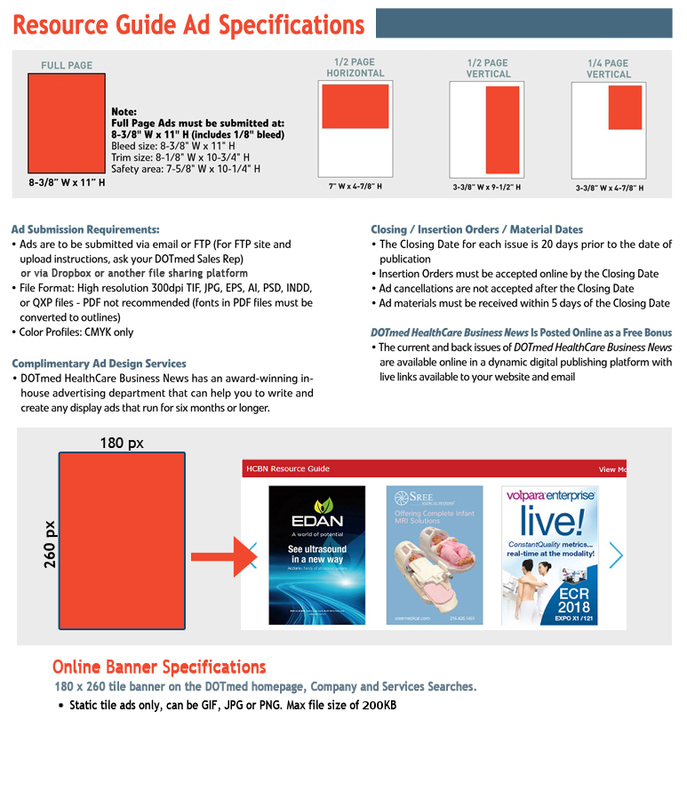 Receive placement on DOTmed's homepage and monthly magazine with this combo package. Appear on DOTmed's homepage linking to your website with our Resource Guide. DOTmed.com has over 270000 registered users and 22,000 daily visitors. Your ad also appears opposite Company and Service searches. 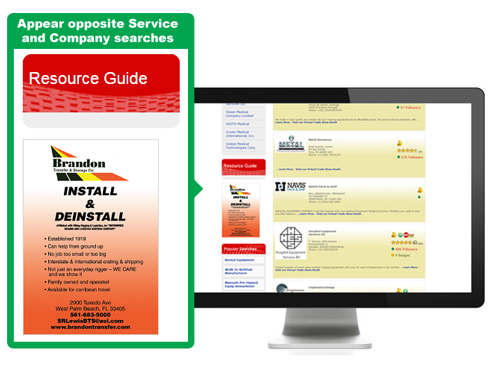 Resource Guide Slider ads link directly to your company website. 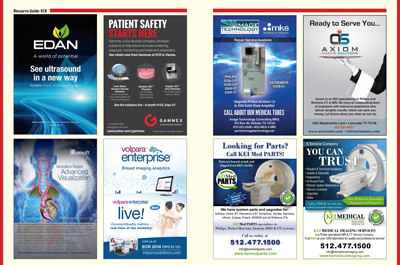 Preview Email Placement for ECR, AAMI, SNMMI, AHRA, FIME & RSNA exhibitors. Booth write up in print for AAMI, HIMSS, SNMMI, AHRA, FIME, ASTRO & RSNA exhibitors. New Product Showcase for AAMI, SNMMI, AHRA, FIME & RSNA exhibitors. 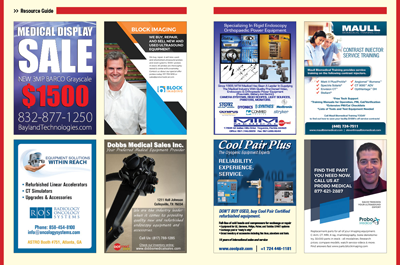 For the cost of exhibiting at a single trade show your ad in HCBN magazine will be distributed at every show below. 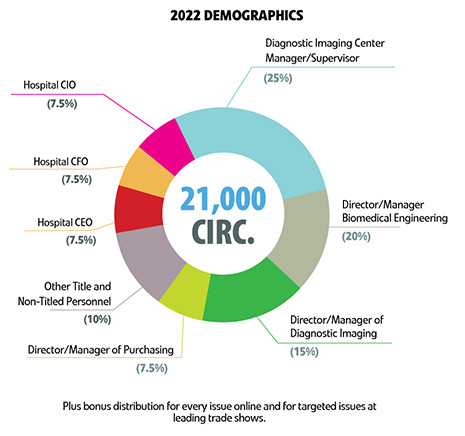 HCBN is circulated at over 30 industry events including HIMSS, ECR, HCO-OR, HCP-Hospital Supply Chain, NAPT, HCP-Radiology, IDN Spring, AAMI, SIIM, SGNA, SNMMI, AHRA, FIME, CEAI, CMIA, NCBA, GBIS, AHRMM, SIIM-NYMIIS, IDN Fall, ASTRO, IMMEXLS, RSNA, FBA, HMMS-NJ, Florida Healthcare Engineering Society, Intalere, ASHE, Mid-Atlantic Society for Healthcare Materials Management, HTMA-MW, and North Central Biomedical Association. Free Ad Design for all 5x or 10x purchases. You keep the artwork for use anywhere you like. Book your 5x Resource Guide ad and 2018 Buyer's Guide ad simultaneously for a 5% discount. Book your 10x Resource Guide ad and 2018 Buyer's Guide ad simultaneously for a 10% discount.